Arunachal Pradesh /ˌɑrəˌnɑːtʃəl prəˈdɛʃ/ is one of the 29 states of India. Located in northeast India, it holds the most north-eastern position among the other states in the north-east region of India. Arunachal Pradesh borders the states of Assam and Nagaland to the south, and shares international borders with Bhutan in the west, Myanmar in the east and China in the north. Itanagar is the capital of the state. China claims the northern part of the state as a part of the Tibet Autonomous Region. In 1913–1914 representatives of China, Tibet and Britain met in India ending with the Simla Accord. However, the Chinese representatives refused the territory negotiation. This treaty's objective was to define the borders between Inner and Outer Tibet as well as between Outer Tibet and British India. British administrator, Sir Henry McMahon, drew up the Script error: No such module "convert". McMahon Line as the border between British India and Outer Tibet during the Simla Conference. The Tibetan and British representatives at the conference agreed to the line and Tibet ceded Tawang and other Tibetan areas to the British Empire. The Chinese representative had no problems with the border between British India and Outer Tibet; however on the issue of the border between Outer Tibet and Inner Tibet the talks broke down. Thus, the Chinese representative refused to accept the agreement and walked out. The Tibetan Government and British Government went ahead with the Simla Agreement and declared that the benefits of other articles of this treaty would not be bestowed on China as long as it stays out of the purview. The Chinese position was that Tibet was not independent from China, so Tibet could not have independently signed treaties, and per the Anglo-Chinese (1906) and Anglo-Russian (1907) conventions, any such agreement was invalid without Chinese assent. Simla was initially rejected by the Government of India as incompatible with the 1907 Anglo-Russian Convention. However, this agreement (Anglo-Russian Convention) was renounced by Russia and Britain jointly in 1921. However, with the collapse of Chinese power in Tibet, the line had no serious challenges as Tibet had signed the convention, therefore it was forgotten to the extent that no new maps were published until 1935, when civil service officer Olaf Caroe called attention to this issue. The Survey of India published a map showing the McMahon Line as the official boundary in 1937. In 1938, the British finally published the Simla Convention as a bilateral accord two decades after the Simla Conference; in 1938 the Survey of India published a detailed map showing Tawang as part of North-East Frontier Agency. In 1944 Britain established administrations in the area from Dirang Dzong in the west to Walong in the east. Tibet, however, altered its position on the McMahon Line in late 1947 when the Tibetan government wrote a note presented to the newly independent Indian Ministry of External Affairs laying claims to (Tawang) south of the McMahon Line. The situation developed further as India became independent and the People's Republic of China was established in 1949. In November 1950, with the PRC poised to take over Tibet, India unilaterally declared that the McMahon Line is the boundary—and, in 1951, forced the last remnants of Tibetan administration out of the Tawang area. The PRC has never recognised the McMahon Line, and claims Tawang on behalf of Tibetans. The 14th Dalai Lama, who led the Tibetan government from 1950 to 1959, was quoted in 2003 as saying that Tawang was "actually part of the Tibetan administration" before the Simla Accord. He clarified his position in 2008, saying that as far as Tibet was concerned "Tawang is part of India". According to the Dalai Lama, "In 1962 during the India-China war, the People's Liberation Army (PLA) already occupied all these areas (Arunachal Pradesh) but they announced a unilateral ceasefire and withdrew, accepting the current international boundary. More recently, Arunachal Pradesh has come to face threats from certain insurgent groups, notably the National Socialist Council of Nagaland (NSCN), who are believed to have base camps in the districts of Changlang and Tirap. There are occasional reports of these groups harassing local people and extorting protection money. A lake at Sela on the way to Tawang in West Kameng district of Arunachal Pradesh. Arunachal Pradesh receives heavy rainfall of Script error: No such module "convert". annually, most of it between May and September. The mountain slopes and hills are covered with alpine, temperate, and subtropical forests of dwarf rhododendron, oak, pine, maple, fir, and juniper; sal (Shorea robusta) and teak are the main economically valuable species. Arunachal Pradesh accounts for a large percentage share of India's untapped hydroelectric potential. In 2008, the government of Arunachal Pradesh signed numerous memorandum of understanding with various companies planning some 42 hydroelectric schemes that will produce electricity in excess of 27,000 MW. Construction of the Upper Siang Hydroelectric Project, which is expected to generate between 10,000 to 12,000 MW, began in April 2009. The state, on account of its unrivalled aesthetics and diverse cultural heritage possesses a great tourism potential. Popular tourist attractions include Tawang (a town with a Buddhist monastery) at 3000 m elevation, Ziro (which holds cultural festivals),Basar, the Namdapha tiger project in Changlang district and Sela lake near Bomdila with its bamboo bridges overhanging the river. Religious places of interest include Malinithan in Lekhabali, Rukhmininagar near Roing (the place as per the popular Hindu mythology, Rukmini, Lord Krishna's wife, said to have lived), and Parshuram Kund in Lohit district as Puranas is the lake where sage Parshuram washed away his sins, The Ganga lake(Gyaker sinyi or Gekar Sinyi)and various other tourist hot spots. The state is rich in wildlife and has a number of wildlife sanctuaries and national parks with rare animals, birds and plants. Perhaps the highest diversity of mammals in India is in Arunachal Pradesh (200+ species). The diversity of birds is also very high, 700+ and is second only to Assam. An uncertain but relatively large percentage of Arunachal's population are nature worshippers(indigenous religions), and follow their own distinct traditions institutions like the Nyedar Namlo by the Nyishi, the Rangfrah by the Tangsa & Nocte, Medar Melo by the Apatani, the Kargu Gamgi by the Galo and Donyi-Polo Dere by the Adi under the umbrella of the indigenous religion the Donyi-Polo. A small number of Arunachali peoples have traditionally identified as Hindus, although the number is growing as animist traditions are merged with Hindu traditions. Tibetan Buddhism predominates in the districts of Tawang, West Kameng, and isolated regions adjacent to Tibet. Theravada Buddhism is practised by groups living near the Burmese border. Around 19% of the population are followers of the Christian faith, and this percentage is probably growing due to Christian missionary activities in the area. A law has been enacted to protect the indigenous religions (e.g., Donyi-Poloism, Buddhism) in Arunanchal Pradesh against the spread of other religions, though no comparable law exists to protect the other religions. Out of the 705,158 tribals living in Arunachal, 333,102 are Animist (47.24%), 186,617 are Christian (26.46%), 92,577 are Hindu (13.13%), and 82,634 are Buddhist (11.72%). Out of the 101 recognised tribes, 37 have an animist majority (Nissi, Adi Gallong, Tagin, Adi Minyong, Adi, Apatani.etc. ), 23 have a Christian majority (Wancho,Mossang Tangsa, Bori, Yobin.etc. ), 15 have a Hindu majority (Mishmi, Mishing/Miri, Deori, Aka, Longchang Tangsa.etc.) and 17 have a Buddhist majority (Monpa, Khampti, Tawang Monpa, Momba, Singpho, Sherdukpen.etc.). The remaining eight tribes are multi-faith, i.e., they do not have a dominant religion (Nocte, Tangsa, Naga.etc.). Arunachal Pradesh has two highways: the 336 km National Highway 52, completed in 1998, which connects Jonai with Dirak, and another highway, which connects Tezpur in Assam with Tawang. As of 2007, every village has been connected by road thanks to funding provided by the central government. Every small town has its own bus station and daily bus services are available. All places are connected to Assam, which has increased trading activity. An additional National Highway is being constructed following the Stillwell Ledo Road, which connects Ledo in Assam to Jairampur in Arunachal. 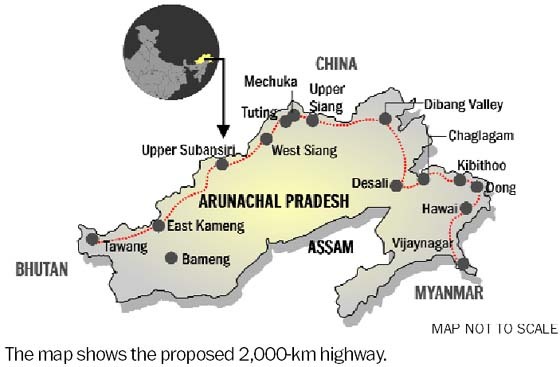 Work on the ambitious 2,400 km two-lane Trans-Arunachal Highway Project announced by Prime Minister Manmohan Singh on 31 January 2008 on his maiden visit to the state, was scheduled to be completed by 2015–16 but now due to political and social reasons it may take another decade. In 2014, two major highways were proposed to be built in the state: East-West Industrial Corridor Highway, Arunachal Pradesh in the lower foot hills of the state and Script error: No such module "convert". Mago-Thingbu to Vijaynagar Arunachal Pradesh Frontier Highway along the McMahon Line, alignment map of which can be seen here and here. Arunachal Pradesh got its first railway line in late 2013 with the opening of the new link line from Harmuti on the main Rangpara North-Murkongselak railway line to Naharlagun in Arunachal Pradesh. The construction of the 33 kilometre 1,676 mm (5 ft 6 in) broad gauge railway line was completed in 2012, and the link became operational after the gauge conversion of the main line under Project Unigauge. The state capital Itanagar was added to the Indian railway map on 12 April 2014 via the newly-built 20 kilometre Harmuti-Naharlagun railway line, when a train from Dekargaon in Assam reached Naharlagun railway station, 10 kilometres from the centre of Itanagar, a total distance of 181 kilometres. The state government is expanding the relatively underdeveloped education system with the assistance of NGOs like Vivekananda Kendra, leading to a sharp improvement in the state's literacy rate. The main universities are the Rajiv Gandhi University (formerly known as Arunachal University), Indira Gandhi Technological and Medical Sciences University () and Himalayan University as well, together with nine affiliated Government Colleges as well as four private colleges. The first college, Jawaharlal Nehru College, Pasighat, was established in 1964. The First Technical University is Established in 2014 namely North East Frontier Technical University (NEFTU) In Aalo, West Siang District by The Automobile Society India, New Delhi.There is also a deemed university, the North Eastern Regional Institute of Science and Technology as well as the National Institute of Technology, Arunachal Pradesh, established on 18 August 2010, is located in Yupia (headquarter of Itanagar). NERIST plays an important role in technical and management higher education. The directorate of technical education conducts examinations yearly so that students who qualify can continue on to higher studies in other states. ^ "Report of the Commissioner for linguistic minorities: 47th report (July 2008 to June 2010)" (PDF). Commissioner for Linguistic Minorities, Ministry of Minority Affairs, Government of India. pp. 122–126. Retrieved 16 February 2012. ^ Wirsing, Robert G.; Christopher Jasparro; Daniel C. Stoll (2012). "Source of Transboundary River Disputes". International Conflict Over Water Resources in Himalayan Asia. Palgrave Macmillan. p. 103. ISBN 978-0230237834. ^ "The battle for the border". Rediff.com. 23 June 2003. Archived from the original on 16 October 2010. Retrieved 6 October 2010. ^ Maxwell, Neville (1970). India's China War. New York: Pantheon. ISBN 9780224618878. ^ Ramachandran, Sudha (27 June 2008). "China toys with India's border". South Asia (Asia Times). Archived from the original on 11 August 2010. Retrieved 18 September 2010. ^ a b "Tawang is part of India: Dalai Lama". TNN. 4 June 2008. Retrieved 4 June 2008. ^ Thousands flock to see Dalai Lama in Indian state. ^ "Dalai Lama stresses on peace as 30,000 attend Tawang discourse". Sify. Retrieved 9 November 2009. ^ "Trekking in Arunachal, Trekking Tour in Arunachal Pradesh,Adventure Trekking in Arunachal Pradesh". North-east-india.com. Archived from the original on 30 August 2010. Retrieved 6 October 2010. ^ "70,000 devotees take holy dip in Parshuram Kund". Indian Express. Jan 18, 2013. Retrieved 2014-06-29. ^ "Itanagar". Government of Arunachal Pradesh. Jawaharlal Nehru State Museum..
^ "President to visit Arunachal Pradesh". Chennai, India: The Hindu. 14 October 2002. ..Jawaharlal Nehru State Museum..
^ Choudhury, Anwaruddin (2003) The mammals of Arunachal Pradesh. Regency Pub., New Delhi. ^ Choudhury, Anwaruddin (2006) A pocket guide to the birds of Arunachal Pradesh. Gibbon Books & Rhino Foundation (supported by OBC,UK), Guwahati, India. ^ "Census of India: Provisional Population Tables – Census 2011" (PDF). Censusindia.gov.in. Retrieved 11 April 2011. ^ "Census Reference Tables, C-Series Population by religious communities". Censusindia.gov.in. Archived from the original on 13 November 2010. Retrieved 6 October 2010. ^ "Narendra Modi government to provide funds for restoration of damaged highways". http://www.dnaindia.com. Retrieved 27 October 2014. ^ "Govt planning road along McMohan line in Arunachal Pradesh: Kiren Rijiju". Live Mint. Retrieved 2014-10-26. ^ "China warns India against paving road in Arunachal". Ajay Banerjee. tribuneindia.com. Retrieved 2014-10-26. ^ Kalita, Prabin (2015-02-20). "Modi to flag off first train from Arunachal to Delhi". The Times of India. Retrieved 2015-02-23. ^ "Web India". Webindia123.com. 3 October 2007. Archived from the original on 31 August 2010. Retrieved 6 October 2010. ^ "Arunachal Pradesh at a glance". Govt. of Arunachal Pradesh. 40x40px Wikimedia Commons has media related to Arunachal Pradesh.